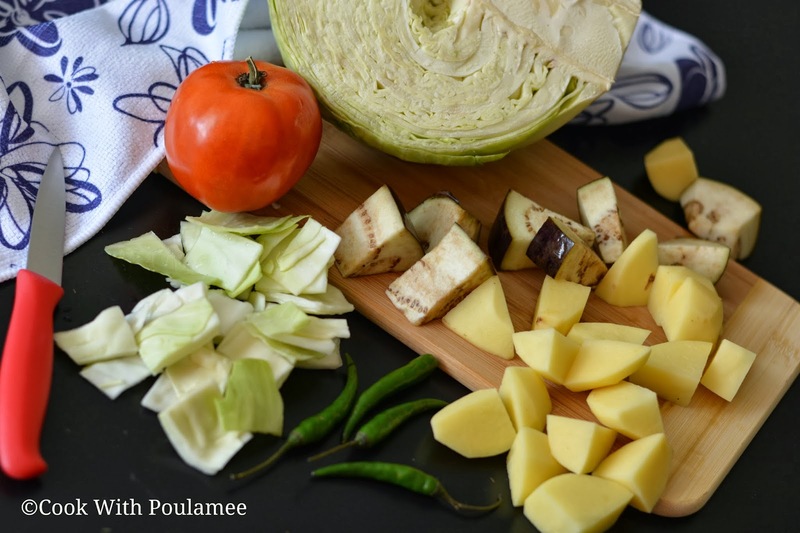 Cook With Poulamee: Badhakopir Ghanto/Cabbage mishmash: From my maa's kitchen. 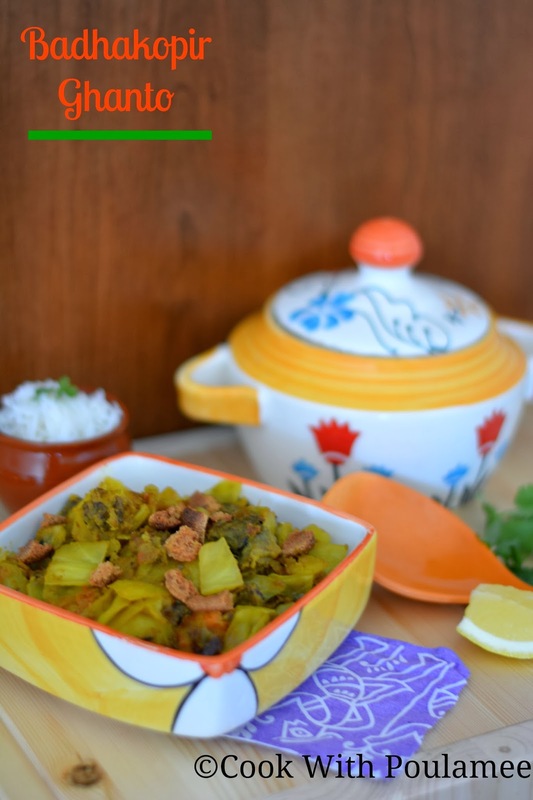 Badhakopir Ghanto/Cabbage mishmash: From my maa's kitchen. In daily food menu needs to be cooked in less oil for health purpose and I also love to follow this. Because oily foods are not good for every day, so better to use some less oil in our daily items. Today I was actually thinking to share one of my Mother’s cabbage recipes which is a very tasty dish and you can cook this in very less oil. 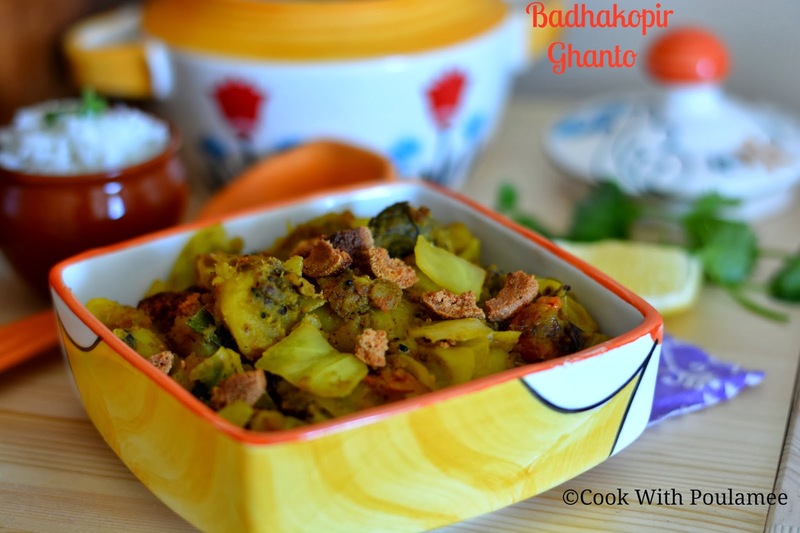 This is an authentic Bengali dish called BADHAKOPIR GHANTO. Cabbage is not my favorite that’s why maa tried to cook in this way some time, and this one is my favorite. Few of my vegetarian friends are asking for a simple cabbage recipe from long time hope this one can be a perfect dish for them. 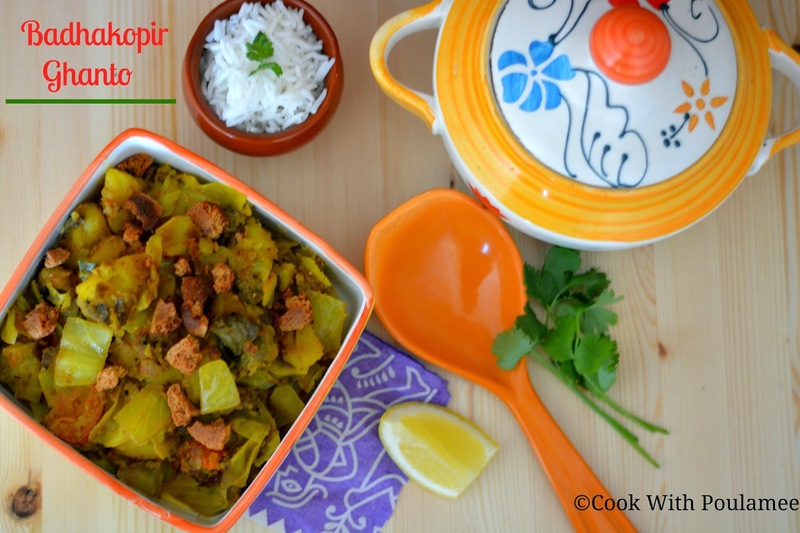 In Bengali term ‘GHANTO’ means where veggies mishmash in their own way and the dish looks like bonding of veggies. 1.Cabbage: Cut into small square shape (one big cup). 2.One medium potato: Cut into medium size. 3.Brinjal or Eggplant: Half of a medium size ( Cut into small square shape). 4.One small size chopped tomato. 5.Paanch Foron: ½ tea spoon. (Methi seeds, cumin seeds, Mustard seeds, Kalonji, Fennel seeds). 6.Mustard seeds: 1 tea spoon. 7.Poppy seeds: 1 tea spoon. 8.Turmeric powder: ½ tea spoon. 11.Two to three table spoon of mustard oil (if you want you can add more). In a vessel add half table spoon of oil allow it to hot then add the brinjal pieces with some salt and fry it with a cover for 2 to 4 mints. Now remove from the heat and keep it aside. Now first make a paste with poppy seeds and mustard seeds with some water and keep it aside. Now in the same vessel add rest of the oil and allow it to hot, now add the paanch foron, after few seconds add the potato pieces, tomato pieces and the green chilies and saute for few mints. Next add the cabbage and mix well. Now add the turmeric powder, salt and sugar and mix well, now cook this in medium heat till the veggies 80% done. Now add the fried brinjal and mix well, finally add the mustard and poppy seeds paste and mix well. Now cook this with a lid for few more mints or till the veggies mix with each other nicely. 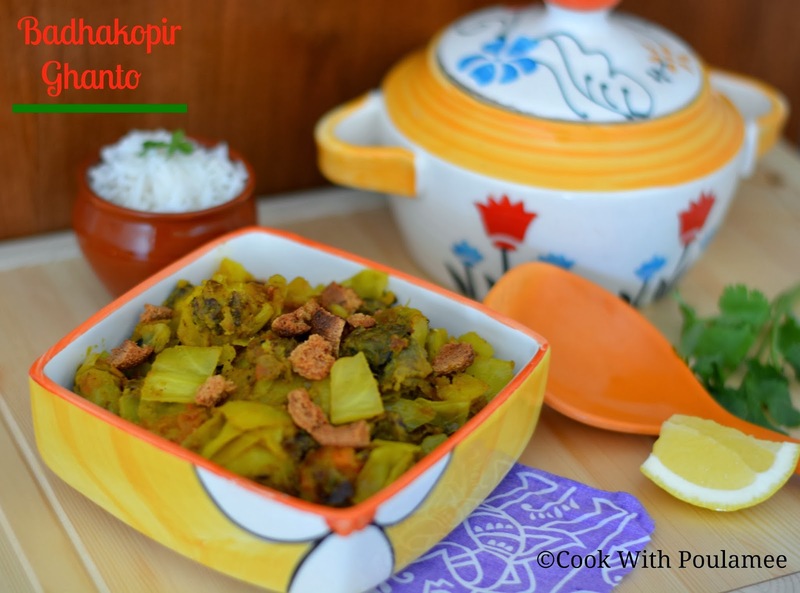 Your BADHAKOPIR GHANTO is ready before serving sprinkle some ready made fried Bori or lentil dumplings.